In order to create Sumidagawa & Curlew River in May 2010, we have made a co-production agreement with UBC Theatre and Film, and Blackbird Theatre. 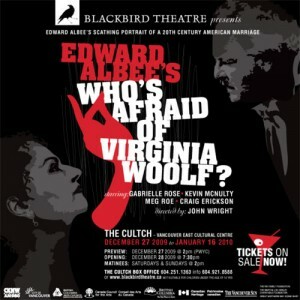 We would like to tell you about Blackbird’s new production of the American classic, Who’s Afraid of Virginia Woolf? by Edward Albee. It runs from 27 December to 16 January at The Cultch. It stars Gabrielle Rose and Kevin McNulty as Martha and George, and Craig Erickson and Meg Roe as Nick and Honey. Its director is John Wright, who is also directing Curlew River for us. We are proud to tell you about this and, BTW, it is going to be a smash success.